There’s a building at 104 Powers Street in Williamsburg, an inconspicuous row house just around the corner from the rooftop bars, art galleries and coffee shops near the Lorimer L stop on Metropolitan Avenue. White clapboard slats, sloping roof. Look closer, and there’s a discreet, white turret topped with a crescent. If no one had pointed it out, you wouldn’t know you were walking past North America’s oldest surviving mosque. Alyssa Ratkewitch is the mosque’s current caretaker. Her grandfather, Alexander, was its Imam during the 1960s. On a warm Saturday afternoon in early October, she drove the hour to Brooklyn from her home in Long Island to give me a tour of the building. It’s been opening only sporadically since the mid-1960s when Lithuanian Tatars began moving out of Brooklyn towards Long Island and beyond. “Some are in Massachusetts, Connecticut, even California,” Ratkewitch told me. But they still drive down to the mosque for major events, she said, such as Kurban Bayrami — the Lithuanian term for Eid — or iftar dinners, or for weddings and funerals. 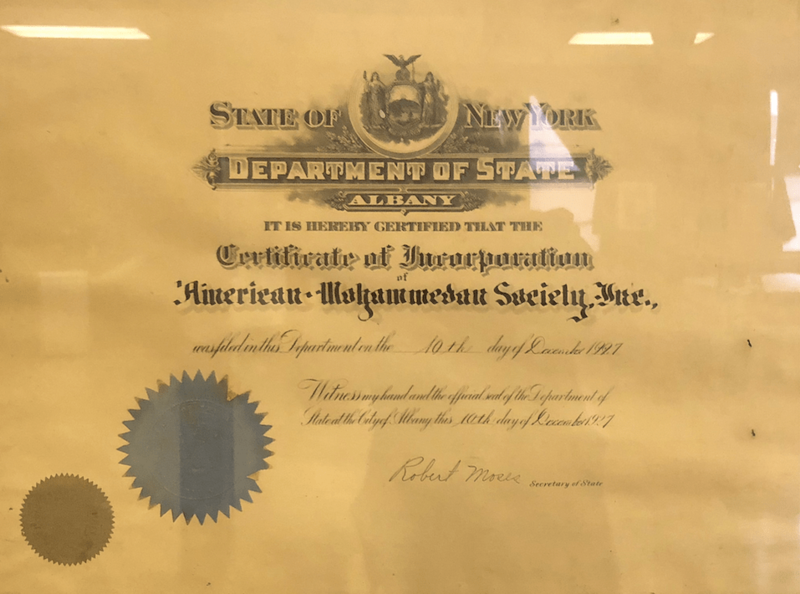 The American Mohammedan Society’s purchase of the property was the fifth since it was marshland owned by William Powers, a landowner for whom the street is named. 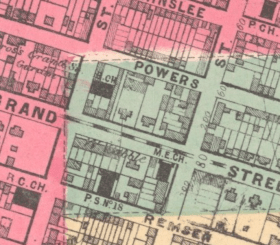 Powers owned several plots of land in what was then called the Village of Williamsburgh; neighboring settlers included Schenck, DeBevoise, Thursby, Boerum, Vandervoort, Polhemus-Wycoff, Harrison, Conklin, and Bogaert farms. By the mid-nineteenth century, Powers had sold the property to Isaac Henderson, the business manager and later, publisher of The Evening Post. Henderson owned 104 Powers Street, along with several other properties, but didn’t develop any of them. Neither did John Stossel — a Prussian florist from Hesse-Darmstadt who purchased the land from Henderson between 1864 and 1866. Instead, he converted the property as a greenhouse for his flowers. Foundations for a building were first laid on 104 Powers Street in 1885, when it became the Powers Street Methodist Episcopal Church. 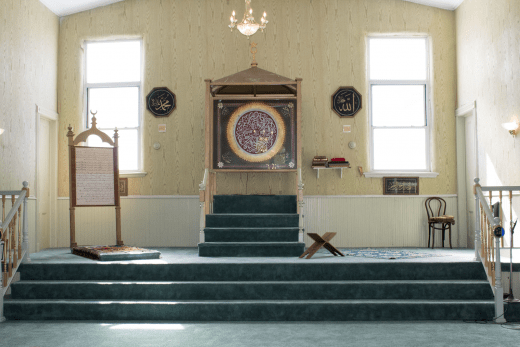 The interior still resembles a church today, with three short steps leading up to an altar on the first floor that the Lithuanian Tatars converted into a mimbar — the Muslim equivalent of a pulpit. Congregants stand diagonally to pray and a makeshift partition separates the women’s prayer area from the men’s section; unlike conventional mosques that face the ka’aba in Mecca, 104 Powers Street is not a purpose-built mosque and led past lives as a District Assembly Clubhouse, a Gospel Church, Episcopal Church and a greenhouse. Lionel Pincus and Princess Firyal Map Division, The New York Public Library. 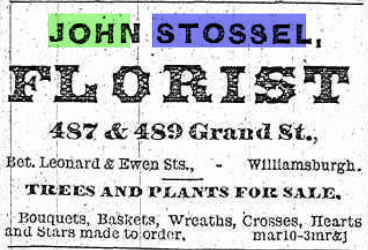 On September 30, 1843, a 26-year-old florist from Prussia named John Stossel arrived in New York aboard the Florida. In Prussia, Stossel had been the head gardener for the King. It took him a few years to settle down in the United States, and on May 1, 1852, Stossel married Elizabeth (Lizzie). Soon after, on June 28, 1861, Stossel and his wife became US citizens and amassed a personal estate value of $1,000 — the equivalent of $30,468 today. Between 1864 and 1866, Stossel purchased 104 Powers Street from the Hendersons along with several other properties, for the purpose of building his greenhouses. 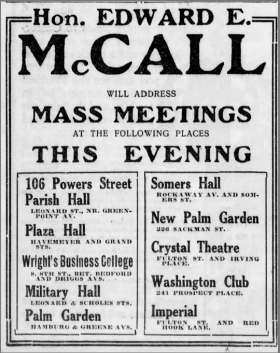 The Newtown Register (New York, New York). June 23, 1881. In the mid-1870s, Stossel began to garner publicity in the local press, but not for the best reasons. On August 18, 1875, the Brooklyn Daily Eaglereported that he, “with a long dagger of antique make, threatened the lives of his wife and other members of his household.” The dagger was a highly prized family relic that belonged to a friend of Stoessel’s, whose family had received it from a German king 600 years earlier. In the weeks that followed, Stossel was committed at the Flatbush Asylum for the Insane, where he remained for the next six months. Towards the beginning of 1876, he had a six-week-long stint at the Asylum for the Insane at Flushing. The Brooklyn Daily Eagle (Brooklyn, Kings, New York). April 12, 1876. Soon after his release from the Flushing asylum, a catastrophic incident rattled Stossel’s life. On the 12th of April, 1876 he and his wife were gathering hay on their Williamsburg farm. As they began driving their carriage toward the barn, a heavy jolt caused Elizabeth to slide off her seat. 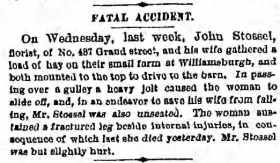 The Eagle reported that Stossel attempted to break her fall, but failed, and both of them tumbled out of the carriage. He emerged unscathed, but Elizabeth sustained a fractured leg and multiple internal injuries. She died a week later. After her death, Stossel’s mental health nosedived once again — this time, reported the Brooklyn Union, permanently. He began to sit on cakes of ice to keep cool, amused himself by shooting off soda water bottles to let the spirit out, imagined that he was beset by witches, and that the devil was coming after him through the windows and doors of his house. The Prussian King’s Gardner became the neighborhood lunatic. n April 1885—a year before Stossel’s death—two Williamsburg developers, Louis Gfroehrer and Edward McCarty, bought 104 Powers Street and sold it immediately to the Second Methodist Episcopal Church, in exchange for the property the church owned nearby at the corner of Grand Street and Ewen Street, which is now Manhattan Avenue. However, the nearby Leonard Street Methodist Church protested that the new location would be too close to its own location. A report in the Eagle on May 20, 1885 described the concerns of the Leonard Street congregation as “an invasion of their territory; and it is intimated that they are about to appeal to the Conference for protection.” Nonetheless, the new church was built and became known as the Powers Street Methodist Episcopal Church. Drama seemed to follow the 104 Powers Street property. In 1887, the church found itself in the middle of a scuffle between its pastor, the Rev. George Mooney and his congregants. 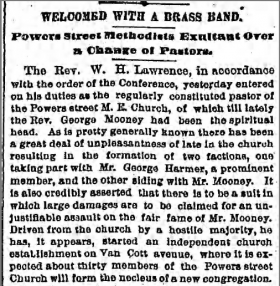 On April 18, 1887, the Eagledescribed this as “a great deal of unpleasantness” that resulted in the formation of two factions among the church’s congregants: one supported George Harmer, a prominent member of the congregation, and the other stood with Mooney. Driven away from the church by a “hostile majority,” Mooney started his own independent congregation on Van Cott Avenue in Greenpoint. The Brooklyn Daily Eagle (Brooklyn, Kings, New York). April 18, 1887. When the church wasn’t caught up in drama, it was the site of a number of child marriages. In April 1892, in a story the Eagle describedas a “pretty romance,” Harry C. Lovejoy, the 18-year-old son of wealthy Lorenzo W. Lovejoy, married 14-year-old Lottie C. Walsh—“one of the prettiest girls in Grammar School No. 8, Brooklyn.” The wedding took place at the Powers Street church, much to the chagrin of his father. Harry and Lottie lied to the pastor, Rev. Nathan Hubbell; Harry claimed he was 20, and Lottie said she was 17. Once Harry’s father found out that his teenage son had married, and stolen his best broadcloth suit, he had him arrested. It took a week for Lovejoy Sr.’s anger to cool and he forgave his son, enabling this release from jail. The couple remained married. By 1896, the fate of the church on 104 Powers Street was sealed. The concerns of the Leonard Street church proved warranted—the membership of both congregations dropped. By April, the Powers Street church and the Leonard Street church united under the umbrella organization of the Brooklyn Church Society, and new church on the Leonard Street property—large enough to accommodate both congregations, opened. The cornerstone-laying ceremony for the new building took place on July 19, 1900. Six months later, the new Union Methodist Episcopal Church opened for the consolidated congregations. Charles H Colby, a manufacturer, and his son bought the Powers Street property from the the Brooklyn Church Society in March 1901. They ran an interdenominational Gospel Mission Church there, with Rev. Edward Holden as the pastor. Charles’ daughter, Lily, directed an industrial school at the church. The Brooklyn Daily Eagle (Brooklyn, Kings, New York). October 30, 1913. In 1913, the Colbys sold the property to the 13th Assembly District Realty Company, and it became the district’s Democratic Club headquarters and clubhouse. From 1913 up til 1931, 104 Powers Street transformed from a quiet place of worship to a noisy clubhouse that hosted meetings, debates, musical programs, charity balls and receptions that lasted till late hours of the night. Neighbors, of course, weren’t pleased. 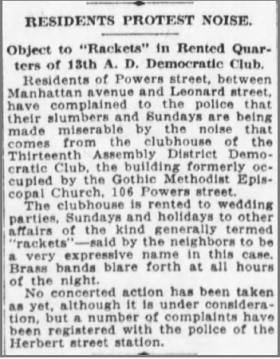 “Residents of Powers street, between Manhattan avenue and Leonard street, have complained to the police that their slumbers and Sundays are being made miserable by the noise that comes from the clubhouse of the Thirteenth Assembly District Democratic Club,” said a report published in Eagle on July 28, 1915. The report went on to describe the activities in the clubhouse as “rackets.” “Brass bands blare forth at all hours of the night,” it said. The Brooklyn Daily Eagle (Brooklyn, Kings, New York). June 28, 1915. Quiet returned to the neighborhood when 104 Powers Street became, once again, a place of worship. This time, however, it wasn’t a church. 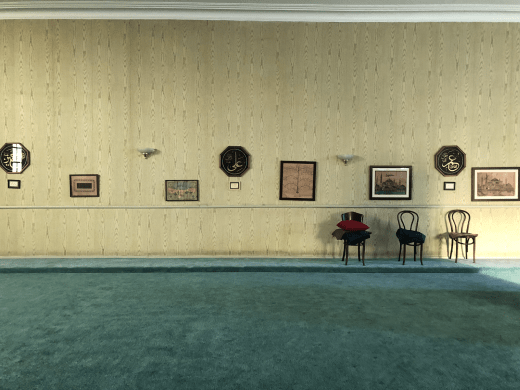 In 1931, the American Mohammedan Society, Inc. — an organization of Tatar Muslims from Lithuania, parts of Poland and Belarus— bought the property from the 13th Assembly District Realty Company, for the purposes of converting the property into a mosque. They filed alteration and plumbing and drainage permits between May and August of that year. Samuel A. Rafalowitz acted as Imam of the mosque in 1934. He was among the waves of migrants from Eastern Europe in the early 20th century, arriving in the United States in 1908 from Vilnius, Lithuania. In 1930, Rafalowitz began renting a house on Leonard Street in Brooklyn, a few blocks away from the Powers Street mosque. 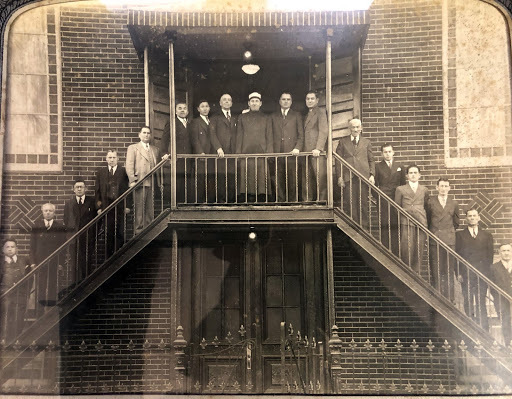 And by 1935, Rafalowitz was the Imam of the mosque, and he, along with his wife, five children, son-in-law and grandson were living in the annex adjacent to 104 Powers Street. Founding members of the Powers Street mosque. Rafalowitz is in the center wearing a white cap. In the mosque’s office, Ratkewitch has carefully kept records of the American Mohammedan Society’s constitution, first drafted in 1907. She also has ledgers from the 1930s onwards; written in neat Cyrillic alphabet, the ledgers contain records of Lithuanian Tatar families who paid their dues to the mosque when it was first established. A framed registration certificate — dated 1927 — hangs on one of the wood panelled walls of the mosque. Scrawled on the certificate is the signature of Robert Moses. She then gestured towards a bunch of framed photographs on the wall —most of them are black-and-white, dating back to the 1940s and yellowing with age, a few are more recent. They’re of community picnics, brunches, get-togethers; grinning parents and grandparents standing behind a row of children sitting cross legged on the grass. “I was looking at these pictures one day and I found my grandmothers — dad’s mom and mum’s mom — sitting next to each other, before they were in-laws. This was a pretty close-knit community,” Ratkewitch said. Peering closely, she also located her aunt and uncle in one of the pictures.